This post is sponsored by Panera Bread. I live in a town where new restaurants have been popping up left and right. I'm always oogling the construction sites, waiting with bated breath for the sign stating which restaurant it will be. Every time I drive by one of the half erected buildings I chant quietly to myself, "Please let it be a Panera, please let it be a Panera." Someone, somewhere must have heard my pleas, because this past year we got one! Woo-hoo! I was finally going to be able to partake in the fresh salads and sandwiches, hearty bagels and breads, sweet delicious pastries and cookies, and steamy hot soup. Seriously, just look at this stuff. Beautiful. Lately, I've been in a soup kind of mood. That always seems to happen when the weather turns a bit cooler, doesn't it? Then again, I'm one of those strange folk that likes to make a big ol' pot of soup in the middle of summer. Call me crazy. I don't think a particular food should be banished to a certain time of year. That's just not fair to me or the soup. 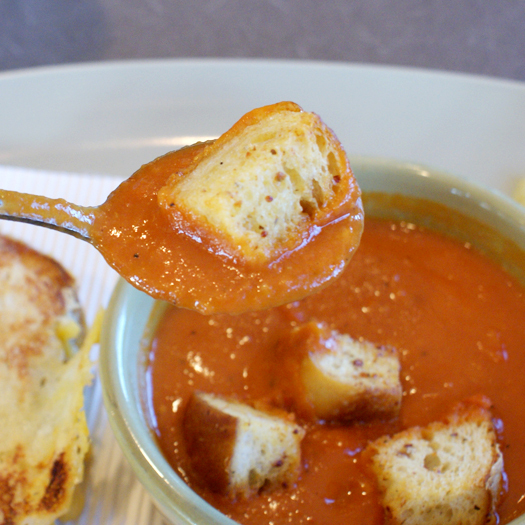 Given the fact that I live in Florida and our cool snap is like an hour long, it's a good thing I like to indulge in soup when the weather's warmer, too. For most, though, the cold weather has settled in and soup is what's on the mind when thinking about what to eat to warm the bones. I have a few soup recipes here on my blog, but one I'm still missing is tomato soup. I've been craving it lately and have tried to whip up a few different versions, but they never come out quite right. When I received a gift card to try out some Panera soup, that's the one I decided I was going to go for. Vegetarian Creamy Tomato. I was hoping it would be exactly what I've been looking for. I stopped by the Panera Bread Soup website before heading out to eat and found out that they have a day by day calendar of what soups are being served, which is pretty handy if you're craving something particular. I also found a section of their website that discusses their affiliation with Feeding America which caught my eye. 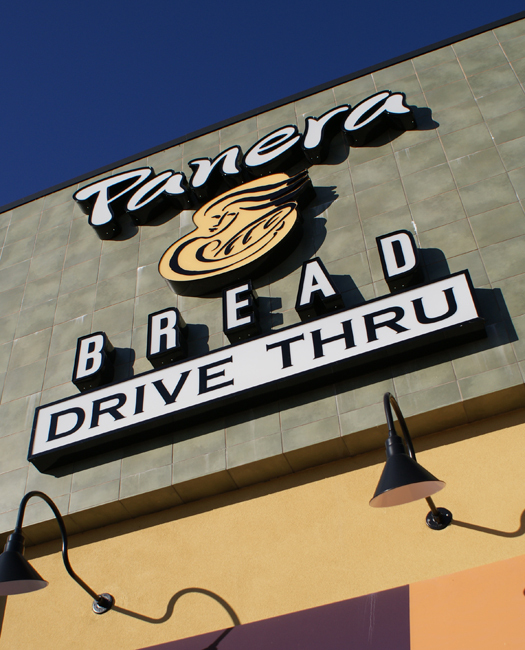 I had heard in the past that Panera Bread donates all unsold bread and baked goods to local area hunger relief agencies and charities, which is, of course, totally awesome. 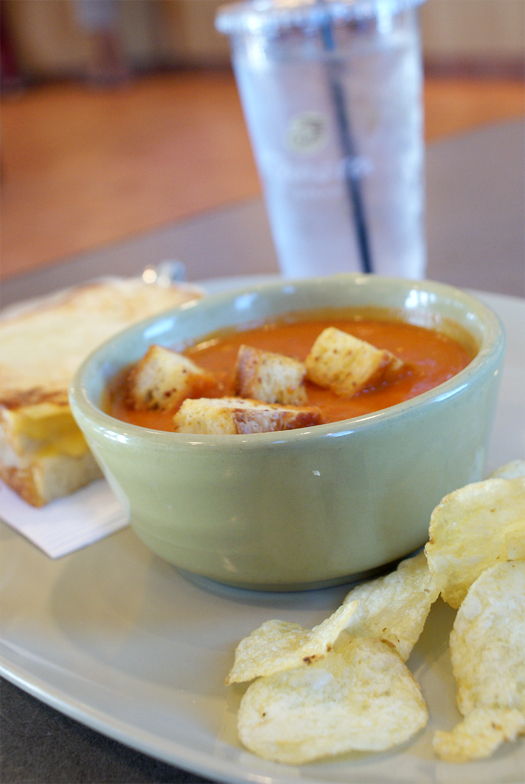 What I didn't know was that starting this past month Panera began donating soup to participating food banks, too. Good stuff, Panera! 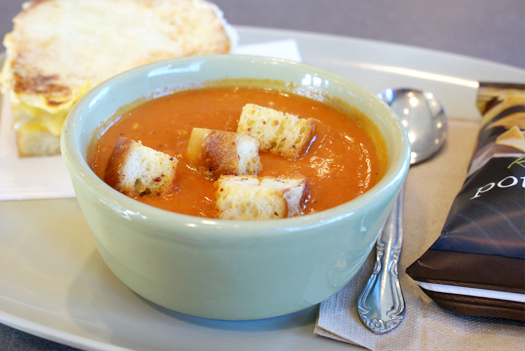 Okay, so now back to the soup...the highly anticipated tomato soup. I'm usually an awful orderer at restaurants. I take eons to decide what I want. Having my mind made up before I walked up to the counter was quite a pleasure! I have to tell you, I was pretty excited about sitting down to eat this soup. First, because I have a three year old and a newborn and a sitting down to eat a meal uninterrupted is pretty much unheard of. Second, because I had skipped breakfast and I was hungry. Third, because it looked so darn good! I snapped a few shots and dug in. The first thing I went for was one of those tasty looking croutons. They were a little crispy, a little soft and had a little cheesiness to them. I was sad when they were gone. 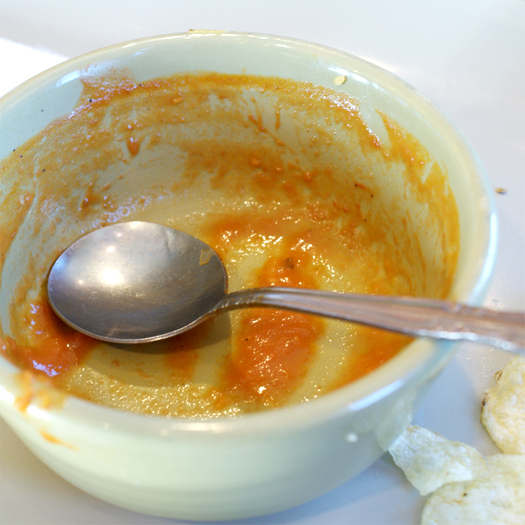 The soup itself lived up to its name. It was nice and creamy and was hot as a tot. Have you ever been served lukewarm soup? I have. Not pleasant. The flavor was just what I had hoped for. It was well seasoned and had just the right tang from the tomatoes. It was good on it's own, so I knew it'd be really good when I dunked my grilled cheese into it. I was right. The sandwich, by the way, was made with sharp white cheddar and bacon. So right in so many ways. 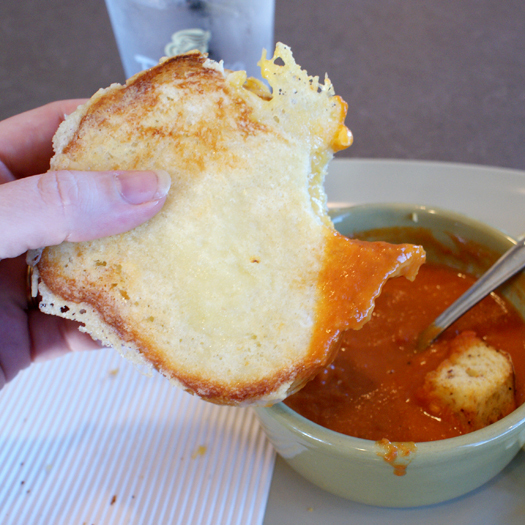 The heartiness of the bread and the sharpness of the cheese were the perfect accompaniment to the soup. I dunked my potato chips, too. Don't knock it 'til you try it. So good. As I ate my soup, my mind wandered a bit and I reflected on my life and how fortunate I am. I don't want for much. I have a nice home, a handsome husband who is an amazing provider, and two beautiful kids. I thought back to before I left the house when I was browsing Panera's website and I read about Panera Cares Cafes. Have you ever heard of them? I hadn't and I was really impressed with the concept. 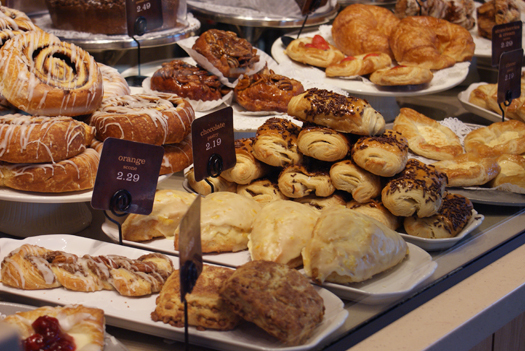 Panera Cares Cafes don't have prices. Instead, they provide suggested donation amounts to help customers understand what it will take for them to operate these cafes and be self-sufficient. In the end, it is up to the customer to decide what to contribute into the donation bins. The whole idea of it makes me want to do more for those less fortunate than myself. I'm going to work on that. I finished up my soup (which was good the the last drop, I might add) and packed up my stuff to head home. My trip to Panera was exactly what this new mom needed. I had a moment of peace, some time to reflect on all of the love in my life and nice cup of soup to warm me up and fill my belly. I left the restaurant felling full and happy in more ways than one. 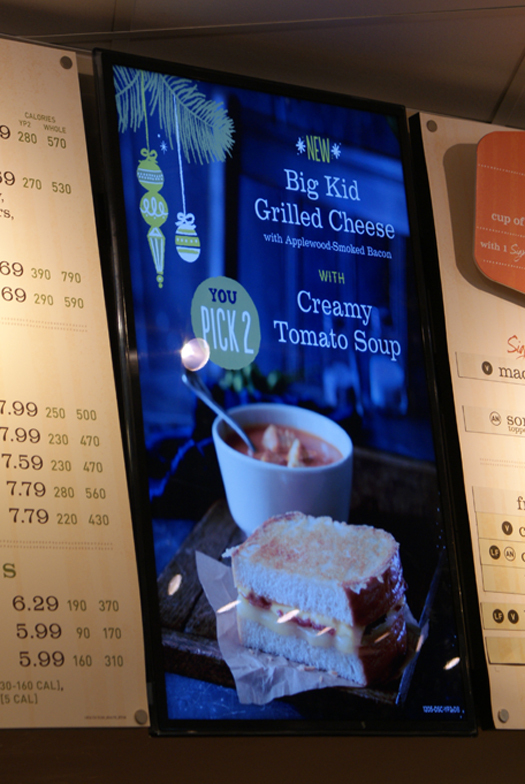 If you have a chance to stop by your local Panera this winter, or anytime for that matter, I suggest you do. There's some good stuff going on there. Finally, if you've taken the time to read this, my wish for you this holiday season is simple; a little bit of peace, a whole lot of love and a comforting cup of Panera Bread Soup. 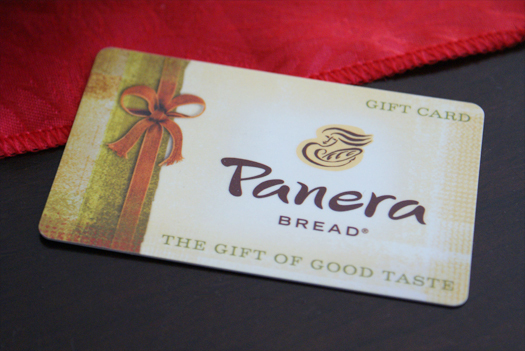 As a part of the DailyBuzz Food Tastemaker program, I received a gift card and stipend to try Panera Bread Soups. Thoughts and opinions are my own.